Cast: Meryl Streep, Philip Seymour Hoffman, Amy Adams, Viola Davis. Written and directed by John Patrick Shanley, adapted from his own play. Story: Priestly kiddy-fiddling - or not? Doubt makes my life easy. If you like serious talkies and fine acting, you'll love it, no question. Doubt has a simple premise that it skirts around without ever wanting to directly talk about it, like seeing a rectangle on the wall where a picture used to hang. 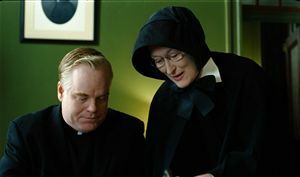 Philip Seymour Hoffman is the jovial priest suspected of "improper behaviour" with one of the boys in the school - suspected, that is, by the two nuns Amy Adams (flimsy but golden-hearted) and Meryl Streep (stick up her arse). Streep's character is one of those achingly awful harpies who start with a conclusion and then work backwards, clinging to the original idea with all the tenacity of a terrier in a tub of toffee, rejecting any possibility that she could - perish the thought - entertain the slightest Doubt. That's as far as I can go with the plot, but to be honest the story is just a clothes horse on which to hang four quite superb performances. I sometimes get the feeling that anyone who criticises Meryl Streep is instantly whisked away by a horde of winged avenging angels (she does look spookily like Death in her nun's habit), but fortunately I need take no such risk as she's captivating in the lead role, as are Amy Adams and Philip Seymour Hoffman. The fourth garment on the clothes horse is Viola Davis - her role only lasts a couple of scenes but it's memorable enough to net her a Best Supporting Actor nomination in the upcoming Oscars. There isn't a scene in the whole movie that isn't beautifully delivered, and the 104 minutes fly by in a way that most action movies would kill for, let alone a heavy tome such as this. Doubt is not a movie for the masses. You need to immerse yourself in it, and not get bored by long periods of dialogue. If that sounds like you, go and see it before the Oscars so you can decide who to cheer for (all four are up for gongs). Will you find a movie this year with a better spread of supreme acting? I Doubt it. Testosterone Satisfaction Rating: 0/5 - definitely not for the jocks. To enjoy this film: sit back and watch the best in the business at work. Doubt was released in the UK on 6th February 2009.